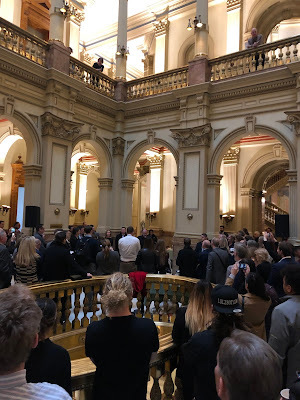 Visionlink was pleased to participate in the Tech - Blockchain Day at the Colorado State Capitol this week. Great times, meeting with other technical firms based here in the state, with representatives and senators, and with various legislative staff. We enjoyed a pleasant discussion with Lt. Governor Dianne Primavera as well, talking about 2-1-1, I&Rs, Disaster solutions, and our work to help connect non profit agencies and their clients. Governor Jared Polis (below), spoke about the value of tech firms to the state and the critical nature of innovation and data security. We also met some great folks working in adult and youth employment, enterprise level blockchain solutions and many others. Now for all the follow up meetings...!